in the former toy store of Chef Bart Desmidt’s parents and offers a beautiful view on the North Sea. The modern interior is light and combines classic luxury with international artworks from artists like William Sweetlove, Arne Quinze, Denmark, Bernard Venet and others. Guests are comfortably welcomed by Lady of the house Sandra Desmidt and the beautiful view on the sea, the luxury look and feel and the comfortable tables will make every diner feel welcome and relaxed. Pictures in cooperation with Shoot That Food. Chef and owner of restaurant Bartholomeus, Bart Desmidt, is a remarkable entrepreneur. 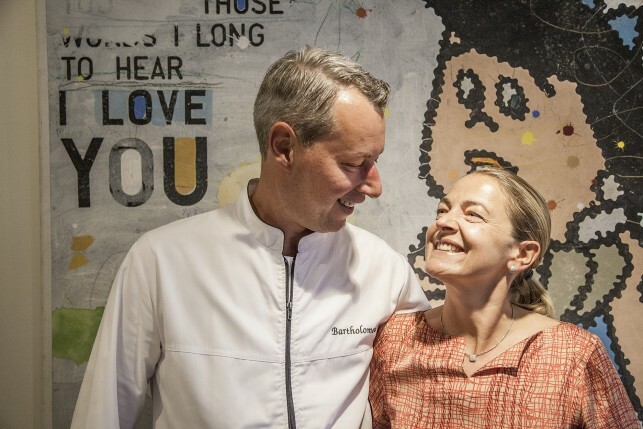 When he was only 23 years old, Bart decided that gastronomy would become his profession and together with his wife Sandra he opened restaurant Bartholomeus. Bart Desmidt never followed cooking school but gained experience in several restaurants at the Belgian coast. 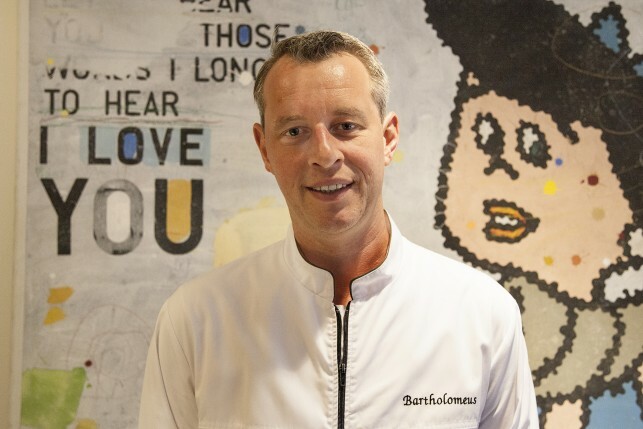 At a very young age the chef and his wife worked day and night to get to the culinary top, and they succeeded: the restaurant grew, the food got better and Bartholomeus is now considered as one of the best at the Belgian coast. The couple is surrounded by a great and loyal team and the sous chef Philip Vandamme and sommelier Marino Opsomer have been working in the restaurant for almost ten years now. A sign that the team loves to work at Bartholomeus! As a self-made chef, Bart employs the philosophy that everything should be made in-house and with heart and soul. And that is what guests should taste in their plates – from the bread and the appetisers until the mignardises. The chef loves to cook with fish (a logical choice with the North Sea just in front of your door) but other ingredients are equally important and variety is an important concept at restaurant Bartholomeus. The menu changes every month and Bart loves to try new combinations, flavours and structures. For Bart is important that every element in a dish should be recognisable and he always works with the best and very fresh ingredients. Sommelier Marino Opsomer presents beautiful wines at restaurant Bartholomeus and impresses with a wide offer of mainly (70%) French wines. He divides his wines in natural and classic wines and modern and old school wines. Marino also dares to take a risk and surprised us with a pairing beer and even a pairing vodka for our dishes. Bartholomeus is a well-established restaurant at the Belgian coast and will surprise you with its tasteful and luxurious dishes, an experienced team and a beautiful location.